The Balearique Socks' pattern has just been released! Believe me when I say that I am over the moon. This is the most fun you can have with teeny, tiny cables without driving yourself completely bonkers. Please note that one gets a bit of (what I consider to be) a break while working the foot of these socks; the twisties get less complicated and are even easily-memorized. The best part? These are sized for Gentlemen's feet (but easily converted to the Ladies' size by changing needles.) 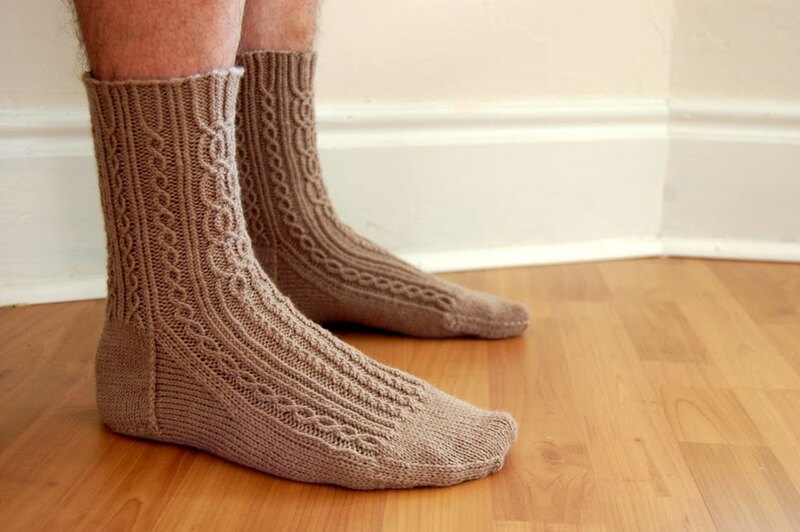 If you've been searching for that perfect pair of fancy socks to make for someone special (even if that person is yourself,) these are the socks for you. As was mentioned in a previous post, this particular pair has gone off to live with Chris Coco, the inspiration for the socks, himself. They do look like the perfect fancy sock- beautiful! July 22, 2010 at 8:38 p.m.
thank god! we need more GOOD designs for men! July 23, 2010 at 1:56 a.m. I love them. They are classic yet stylish, without being too feminine. Great job! July 23, 2010 at 6:38 a.m.
July 24, 2010 at 5:48 a.m.